Saturday morning we woke up early, grabbed breakfast, and went down to the lobby to meet Larry. From the minute we first shook his hand, I just new we were going to have an excellent time together! The view from breakfast over the Forbidden City. 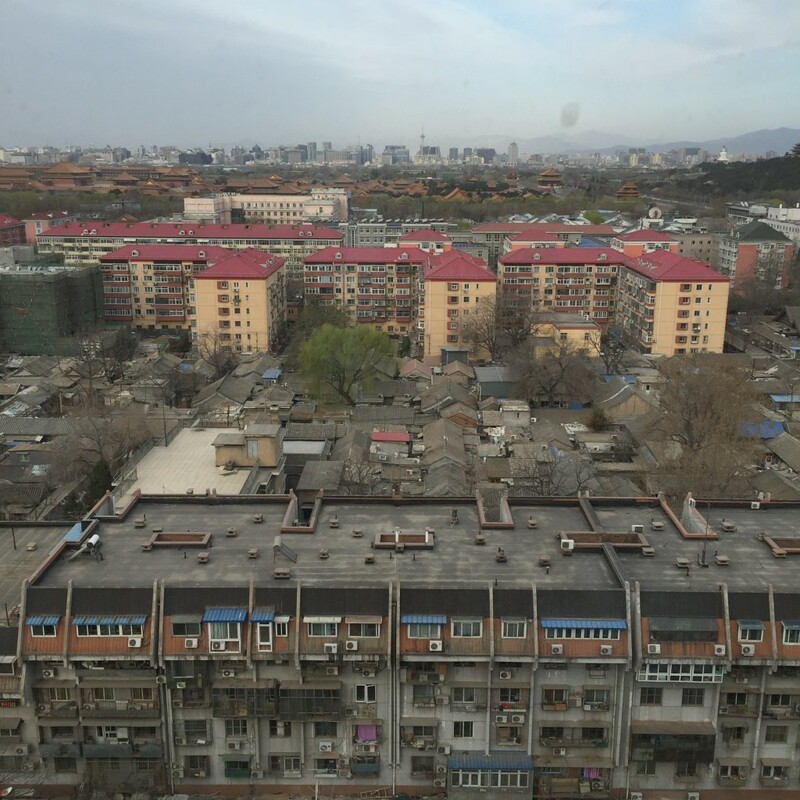 Beijing is known for it’s insane traffic (especially this weekend and then next tree weekends because this is a period known as Weeping Day, where people drive all over the city to pay respects to their ancestors grave sites). Larry on the cultural perspective of child rearing “boys are construction banks and girls are money trees”. Back in the day people only wanted to have boys because boys take care of their parents during their old age. However, to raise a boy you must work your entire life to provide well them (the mentality is you want them to have what you didn’t). You have to buy them a nice car, a good apartment, and be able to supply a good resume for them (regarding information such as family status, familial accomplishments, number of properties, etc.) when it comes to finding a wife—by the way, everything you do to provide for them, is all done with the intention of finding them a good wife. Additionally, when you find a suitable wife for your son, you must pay your future mother-in-law a significant sized dowry in cash (in addition to proving that your son has a good resume, a nice car, and a nice apartment/property inheritance)—hence the expression “boys are construction banks”. Without a good enough dowry the mother-in-law can block the marriage. Thus, they say “girls are money trees” because they make their family lots of money in the form of a dowry and inherit property from both their own family as well as their future husbands family. 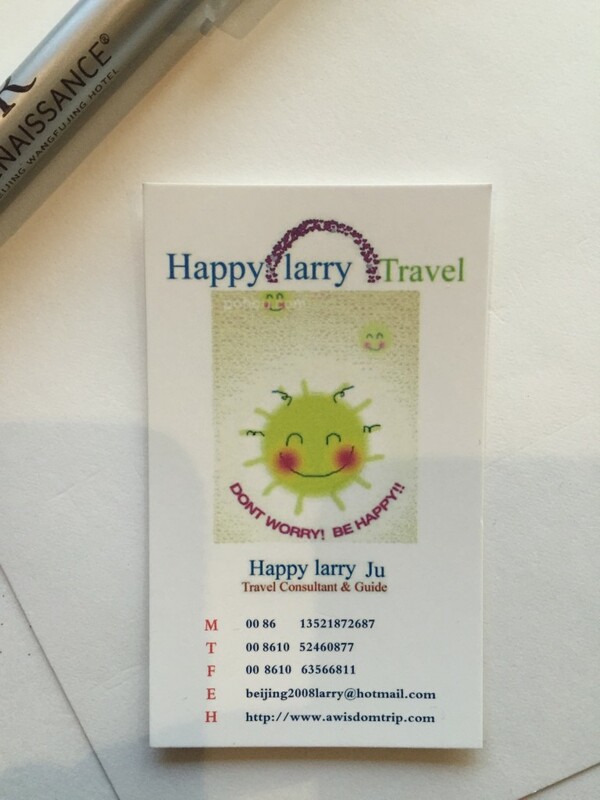 “Marriage is just marketing and PR” according to Larry. Love is involved, but that’s only once child and parents do a good enough job of marketing their children to a suitable match. There are lots of TV shows that focus entirely on dating. I’m not talking about The Bachelor here—this is more like a legal TV auction that people op-into. They go the show, provide information about themselves as well as their contact information so that people watching the show can call in and become potential suitors. So interesting. 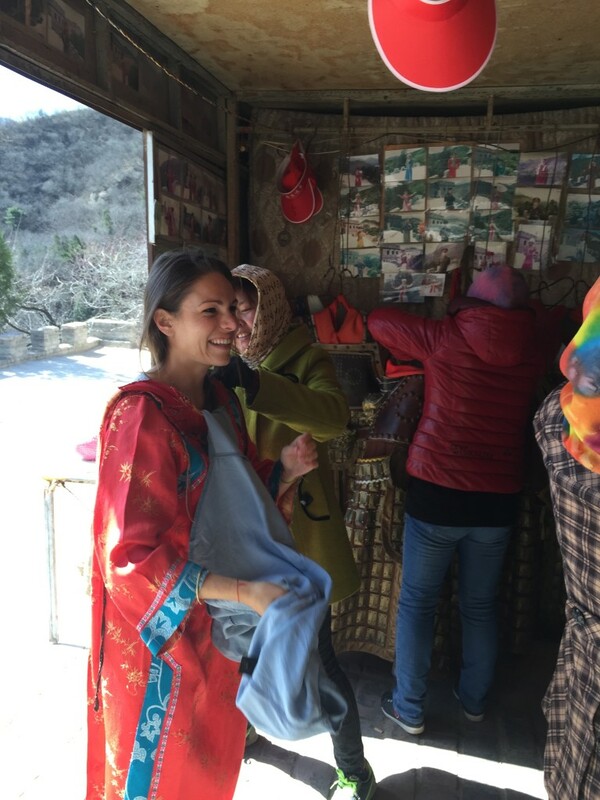 After a very educational car ride we eventually arrived at the Huanghuacheng section of The Great Wall. 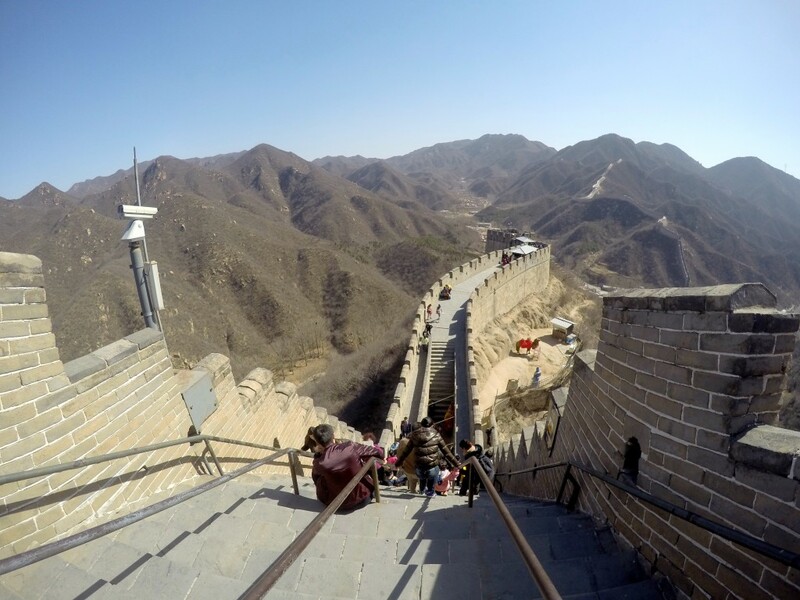 We bought tickets and started our very long and steep climb up the stairs–there were steps of all sizes, some of which went up to the height of my knee. As we ascended the steps we were quickly winded, at some points we were climbing at what felt like a 40-degree angle (but then again I didn’t do so well in geometry, so I’m not really sure what I’m talking about). At one flat part of the steps, some boys approached Daniel and asked if they could take a photo with him, then a girl snuck in and did the same. I don’t think Daniel has ever felt more famous or cooler in his life–he was absolutely beaming afterwards… I guess flattery is the way to his heart. 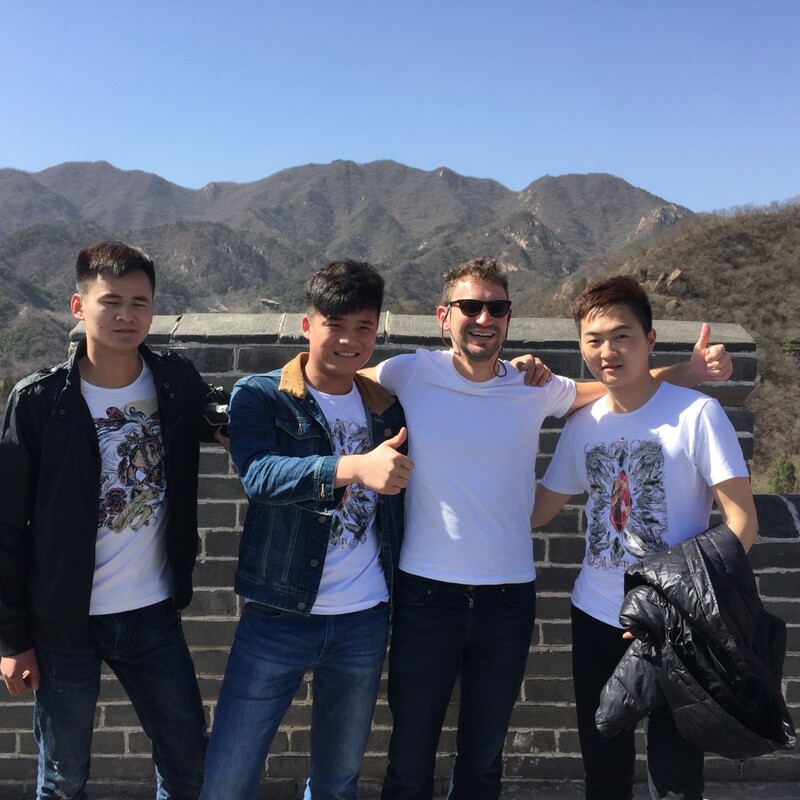 We were the only white people at the wall that day, and apparently quite a source of fascination for many of the Chinese people from rural parts of the country who had traveled there and never seen a white person before. 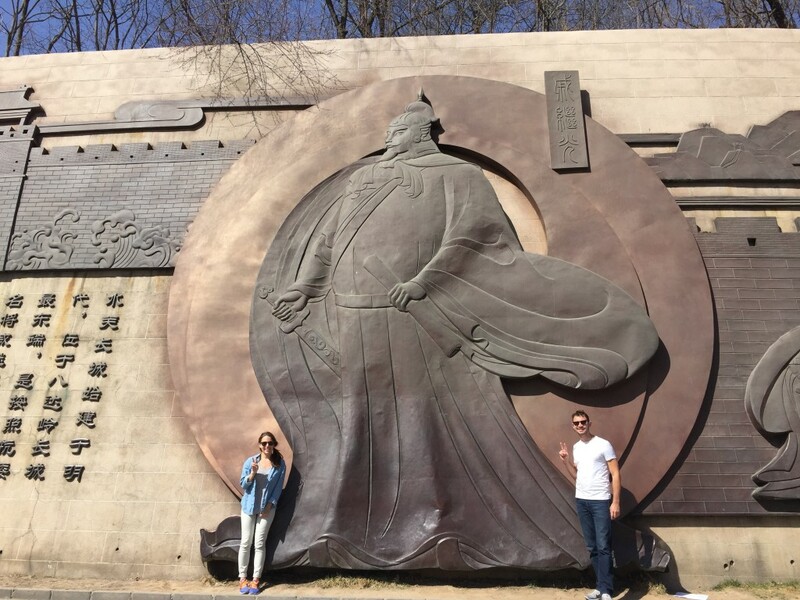 Us posing with a great Han warrior at the bottom of the Huanghuacheng section of the Great Wall. 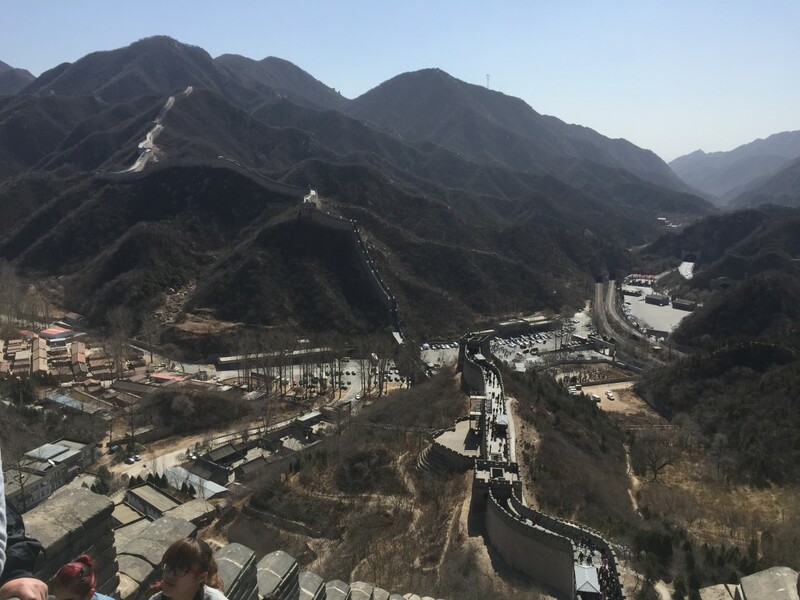 The Huanghuacheng section of The Great Wall of China from higher up. What a view. The Huanghuacheng section of The Great Wall. Some boys approached Daniel and asked if they could take a photo with him. I don’t think Daniel has ever felt more famous or cooler in his life–he was absolutely beaming afterwards… I guess flattery is the way to his heart. 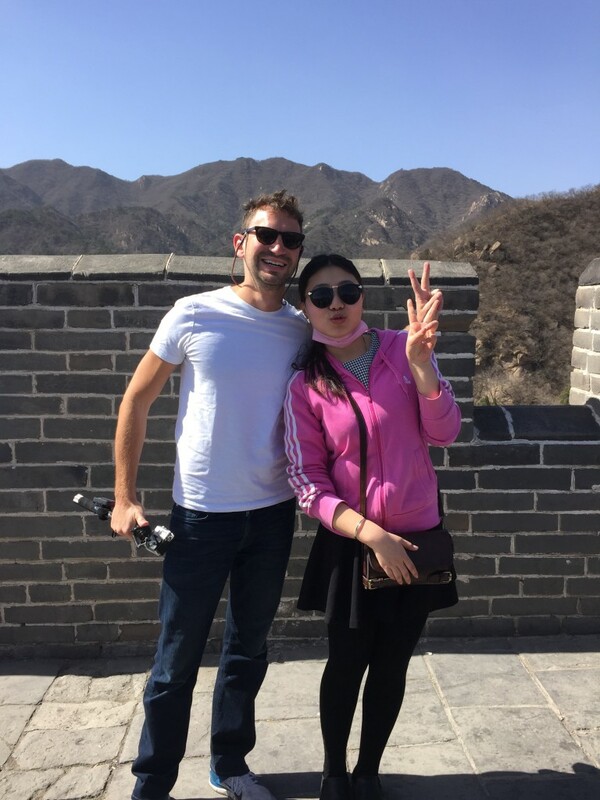 We were the only white people at the wall that day, and apparently quite a source of fascination for many of the Chinese people from rural parts of the country who had traveled there and never seen a white person before. 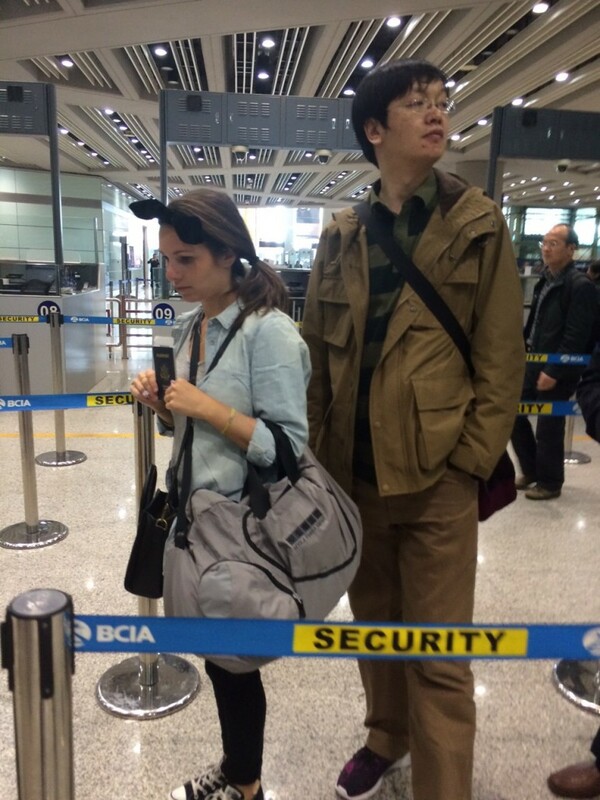 Chinese chick and famous white Daniel. One of our favorite signs on the way up the wall; “please bring your own child”—fail blog submission. 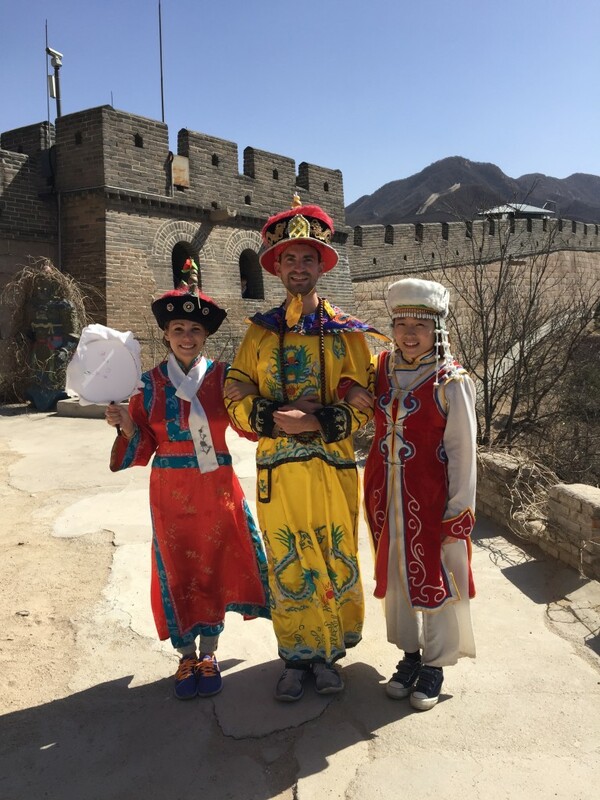 We took lots of photos and videos at The Wall— I think Larry had a little too much fun directing the shots—and eventually found a place where you can pay to get dressed up in traditional Chinese garb and take more photos. Of course, there wasn’t a question of as to whether or not we were doing this. 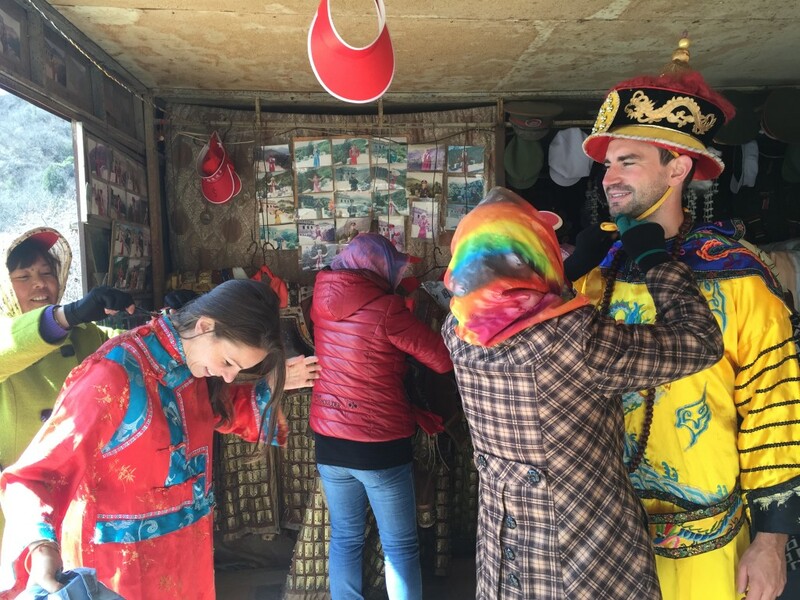 We walked into the alcove where you could pick your outfits and before we know it five Chinese ladies wearing dental hygiene masks were aggressively tying gowns and hats and sashes onto us—they chose the emperor and empress costumes for us (good choice). Larry took a bunch of photos of us (at certain points random people would just come up and pose with us, or take photos of us on their own cameras—so strange) and then we headed down the steps to get back in the car. 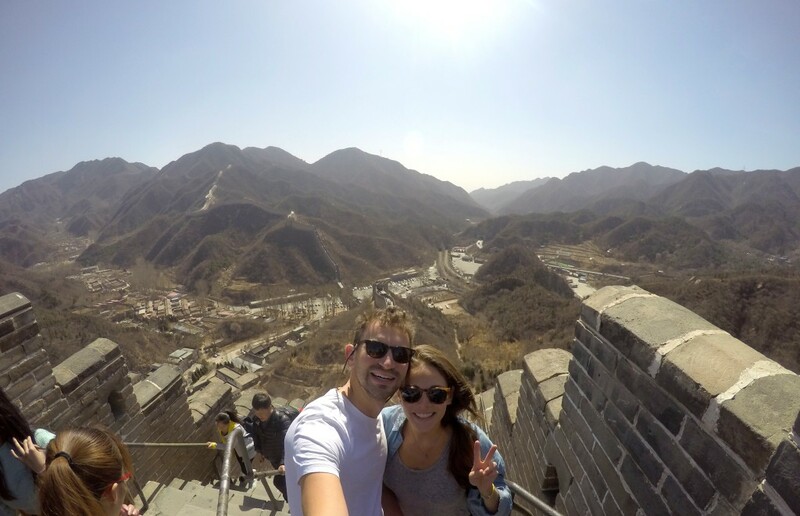 Selfie at the top of the top of the Huanghuacheng section of the Great Wall. 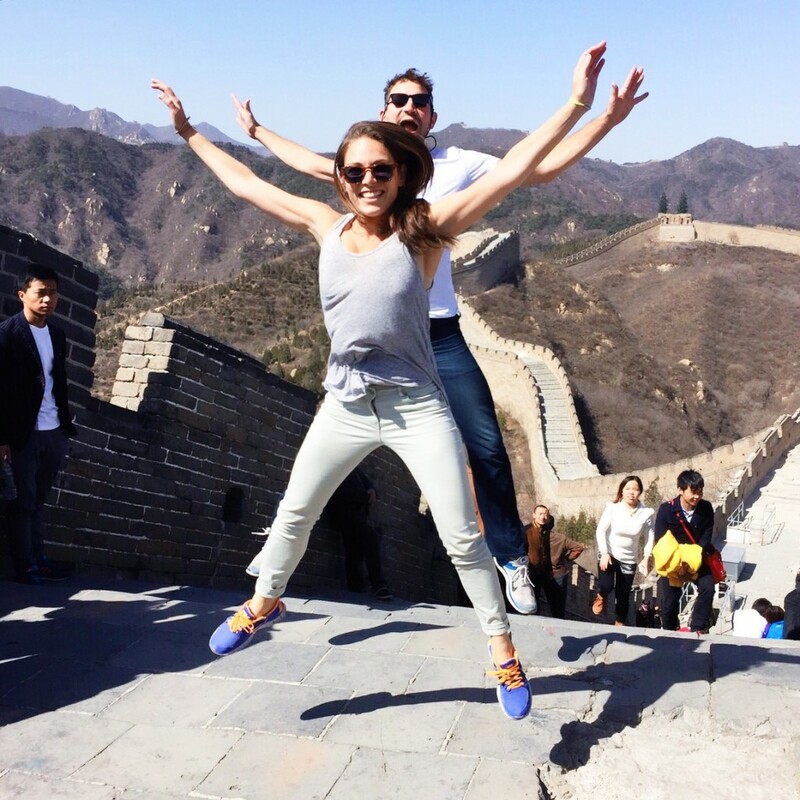 Jumping Jaxy—the Huanghuacheng section of the Great Wall of China. Larry having too much fun directing tandem Jumping Jaxy shots. Another tandem Jumping Jaxy shot directed by Larry. Selfie with Larry at the top of the Wall. Cutest man. The beginning of being swiftly dressed into an empress costume. Five Chinese ladies wearing dental hygiene masks were aggressively tying gowns and hats and sashes onto us. “lets get down to business, to defeat the Huns”—we came, we saw, we conqured—now we’re the Emperor and Empress of China according to Larry. Some random dude hopped into this picture after taking a photo shoot of us on his own camera. At certain points random people would just come up and pose with us, like this chick. 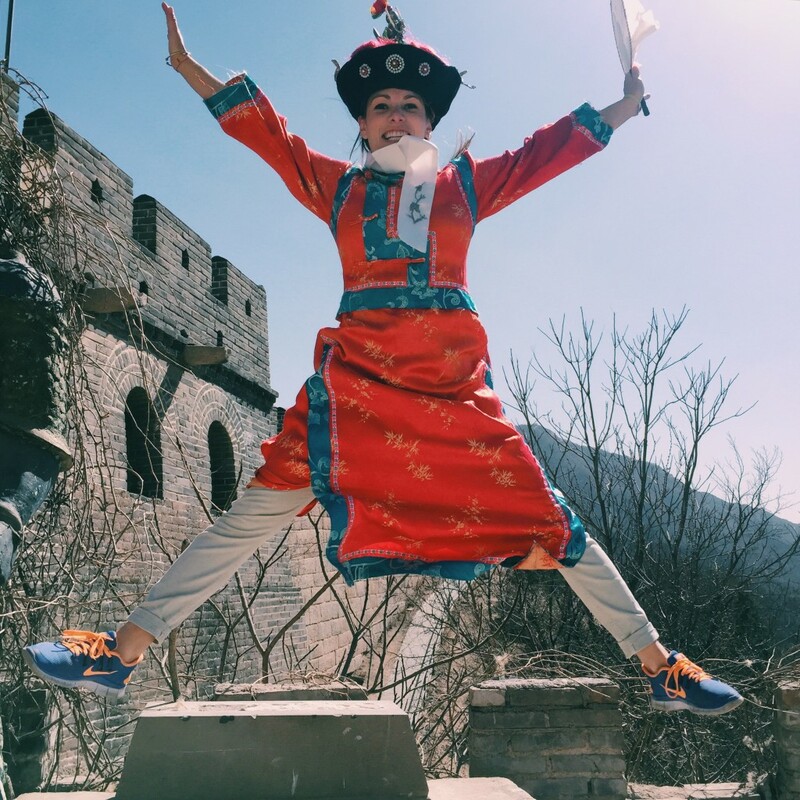 Jumping Jaxy—Great Wall of China dressed up in traditional empress garb by 5 Chinese ladies wearing dental hygienist masks. 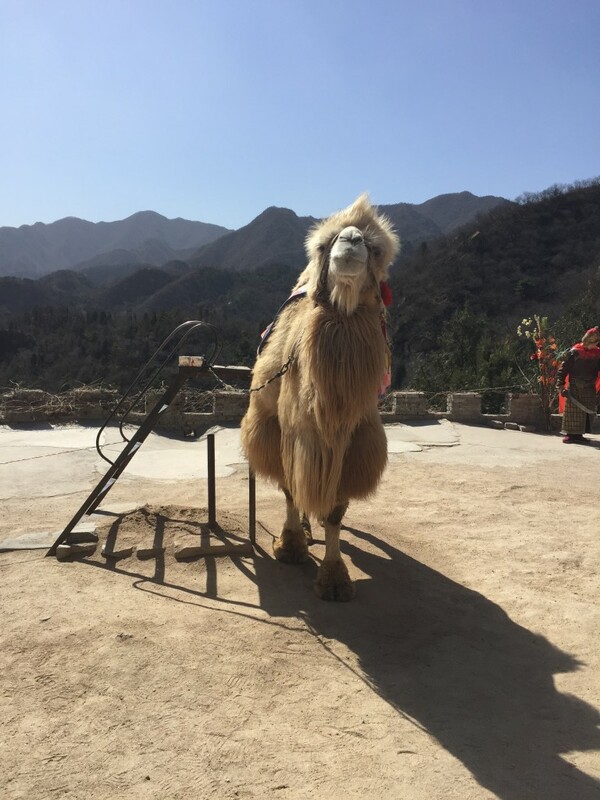 I admit I wasn’t supposed to take this, because you have to pay for the photo, but still, have you ever seen such a fluffy camel before? 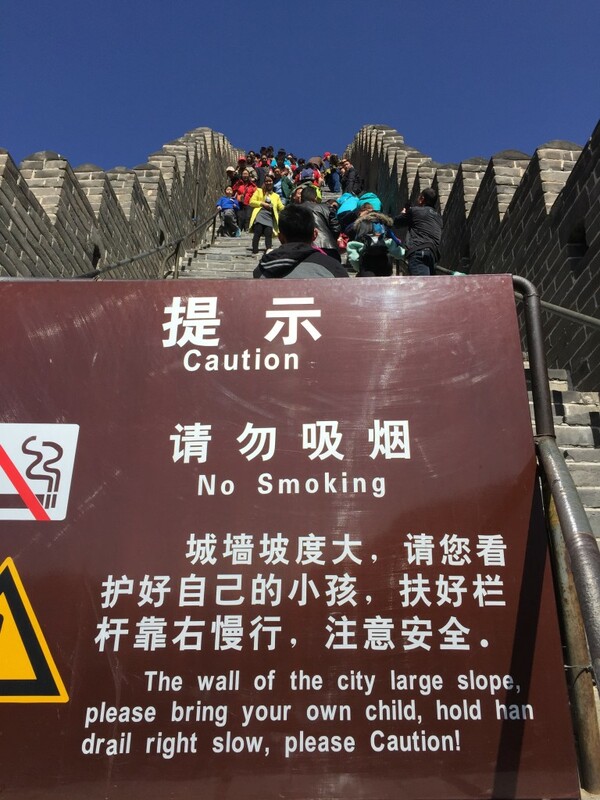 A totally ridiculous sign that clearly must be in China for a reason, informing people not to use the site of the Great Wall as their public bathroom. For lunch we went to a traditional Chinese restaurant called “Wan Rong Seafood” or “Seafood and the Duck” (which sounded more like “Seafood in the Dark” with a local accent). It turns out we arrived right as a massive party was ending—at the other tables there were super drunk men with very red faces stumbling around and intermittently being escorted to the bathroom to vomit. Larry told us that in China men drink alcoholic spirits with 56% alcohol because it’s considered macho, even though it burns their tongue and throat when they drink it. The prices at the restaurant were super cheap so we assumed that all of the dishes were tapas, unfortunately, we were very wrong and ended up with a massive order of all vegetarian food. Between Larry, the driver, and the two of us, we couldn’t even begin to order the feast we had in front of us. 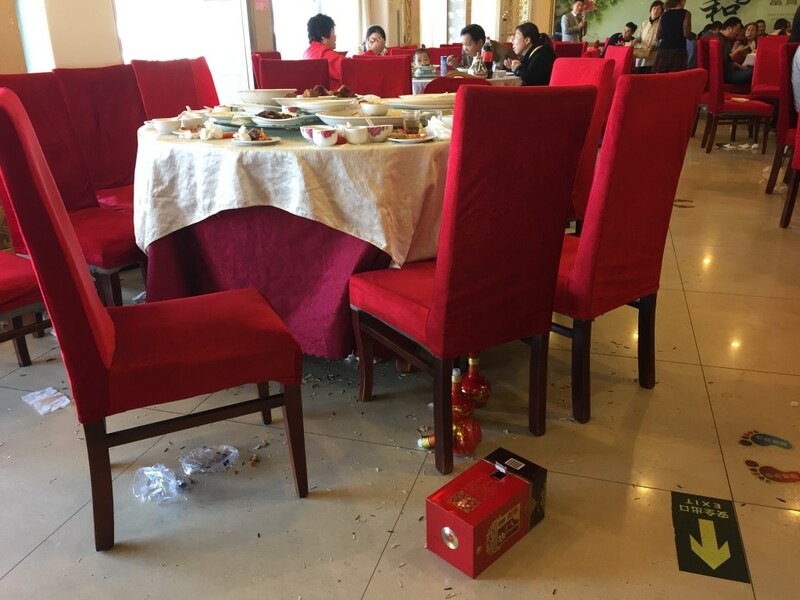 We left the restaurant absolutely stuffed and the wreckage left over from the party was like nothing I’ve ever seen before (I took a photo of one vacant table to give you an idea). 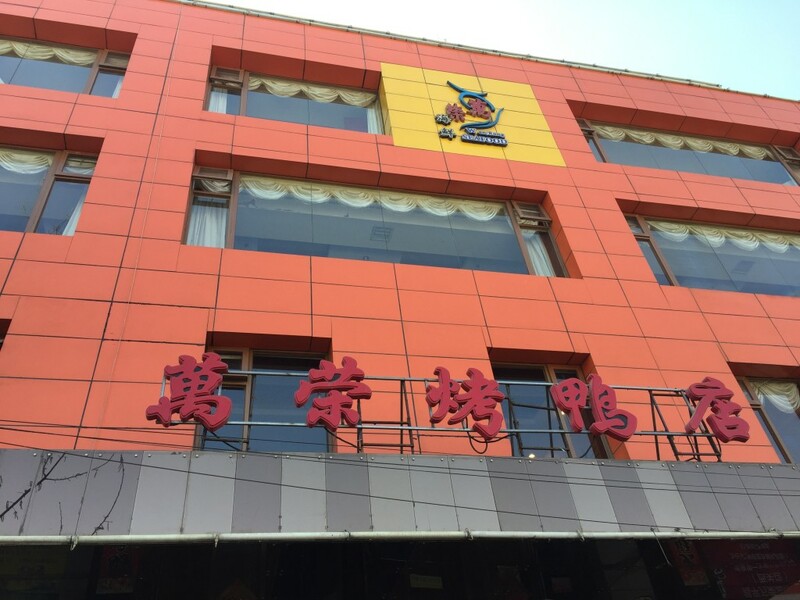 For lunch we went to a traditional Chinese restaurant called “Wan Rong Seafood” or “Seafood and the Duck” (which sounded more like “Seafood in the Dark” with a local accent). 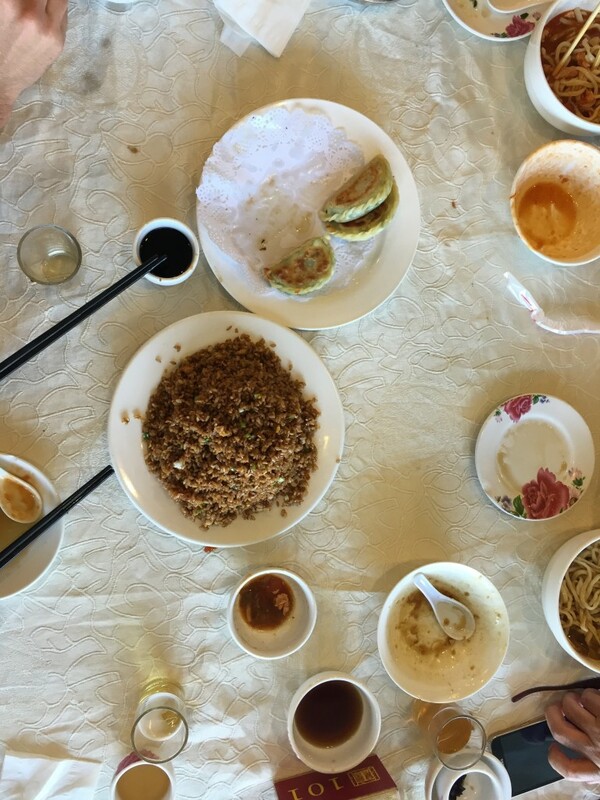 In China men drink alcoholic spirits with 56% alcohol because it’s considered macho, even though it burns their tongue and throat when they drink it.—The wreckage left over from the party was like nothing I’ve ever seen before (I took a photo of one vacant table to give you an idea). The prices at the restaurant were super cheap so we assumed that all of the dishes were tapas, unfortunately, we were very wrong and ended up with a massive order of all vegetarian food. Just a small sample of the food we ordered. On the car ride to The Summer Palace I took a bit of a nap due to my food coma. I woke up feeling super groggy, but the newly famous face of Mr. Daniel got me through the rest of the afternoon. 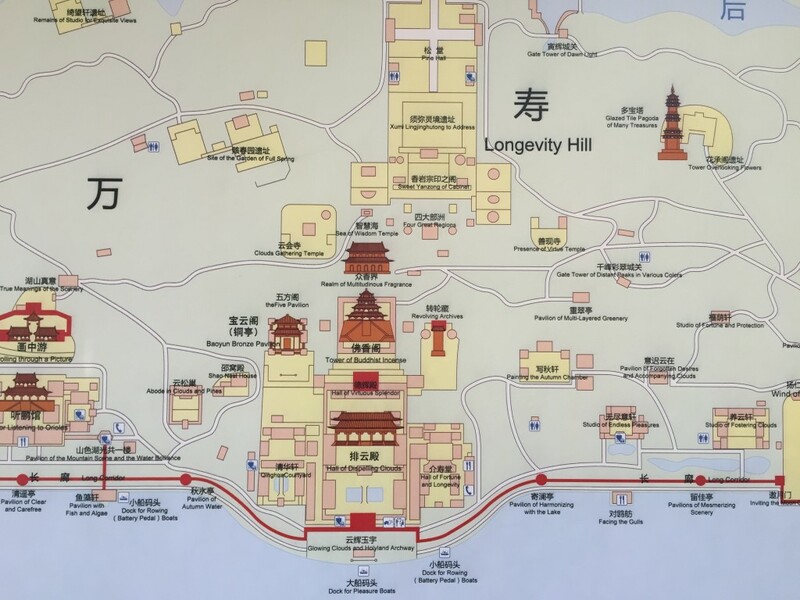 Larry showed us a map of The Summer Palace grounds, which sits on 300 hectors of land—massive. 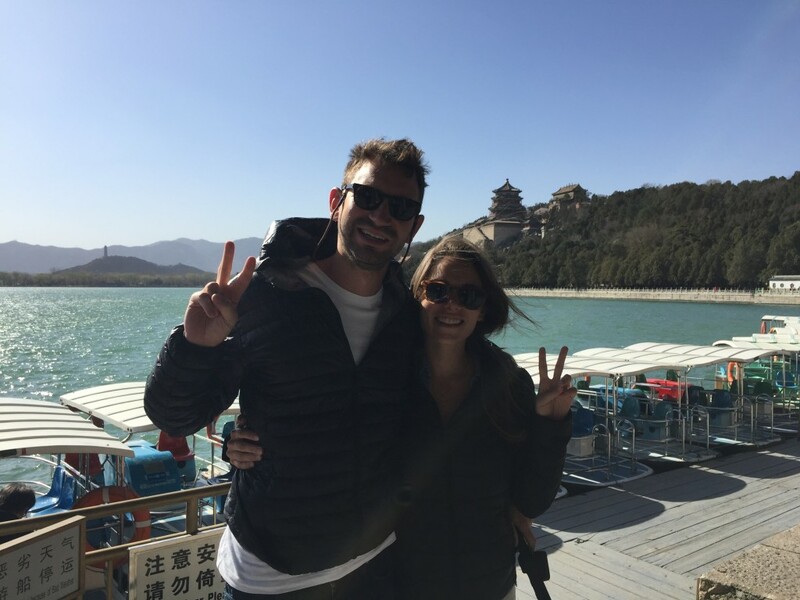 We walked around, went by the river (but it was so old and windy out that they cute little boats weren’t operable), and learned about the Chinese government. Map of the Summer Palace Beijing. 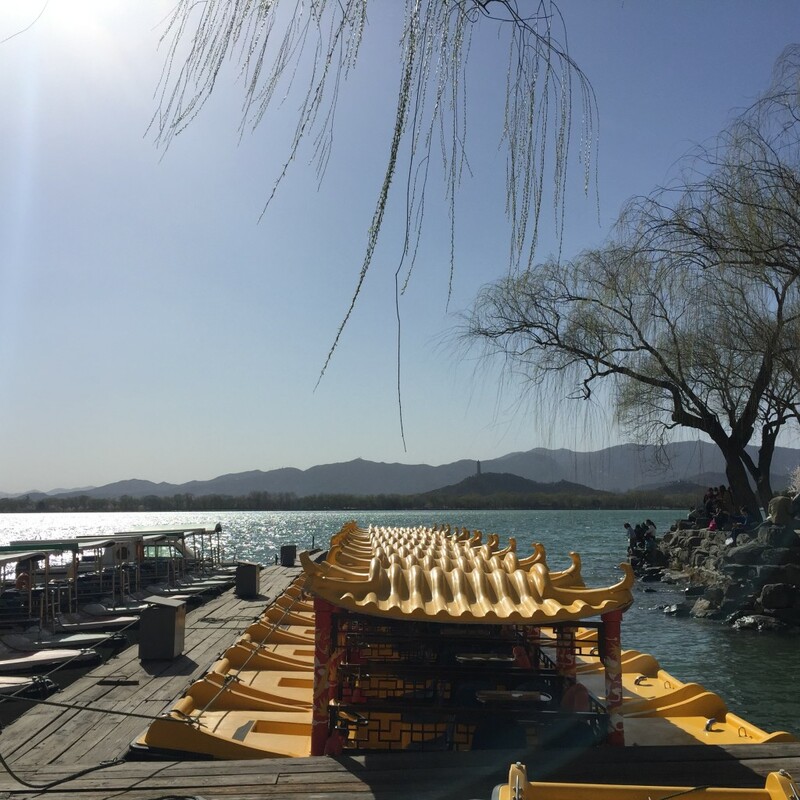 The cute royal looking boats in front of the Summer Palace—it was too cold and choppy to go out. The traffic on the drive back to the hotel took forever! 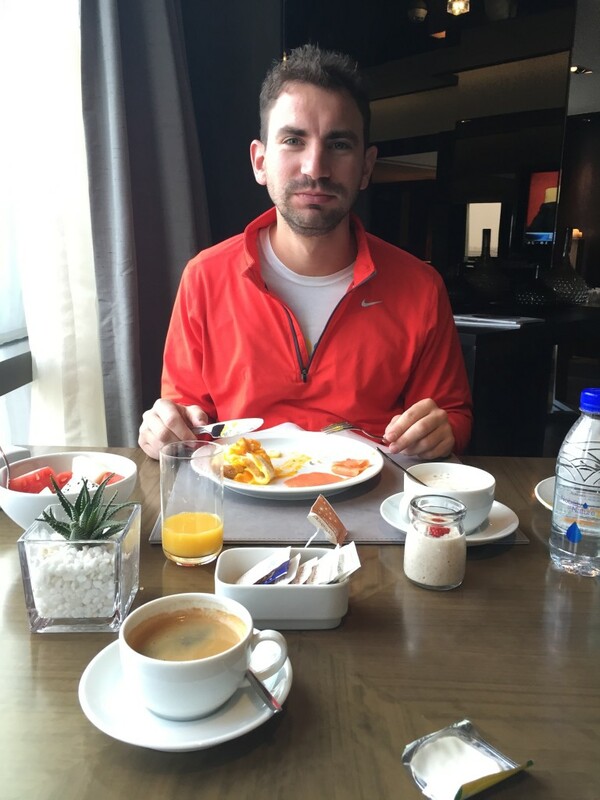 When we finally arrived, we did laundry, and then went upstairs to eat dinner. We sat with our new friends Ervin and Fabritzio and exchanged funny stories about the day, before going downstairs for a quick swim and jacuzzi. Sunday morning we woke up at 7:30 AM and soon after received a call from Larry to inform us that we should dress warmly because it was “chilly cold” outside (42 degrees Fahrenheit). 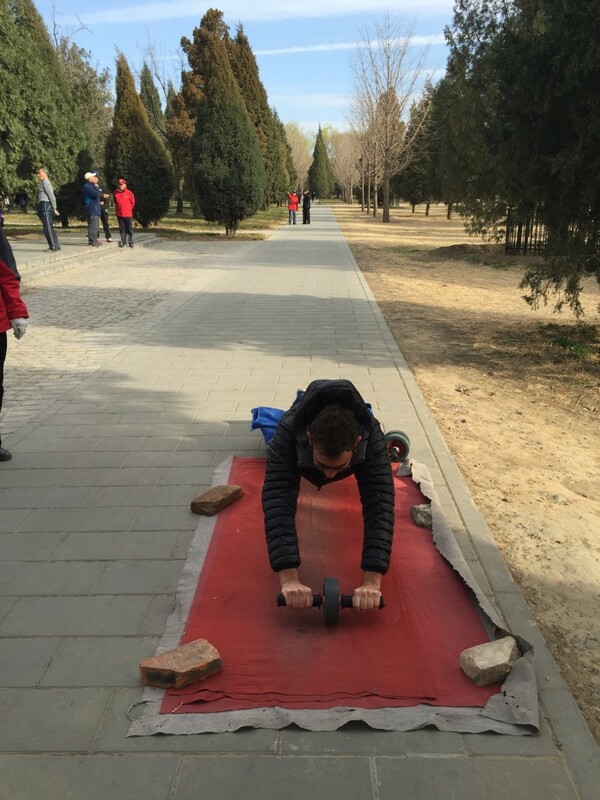 We met him in the lobby and drove to the Temple of Heaven (273 hectors of land). 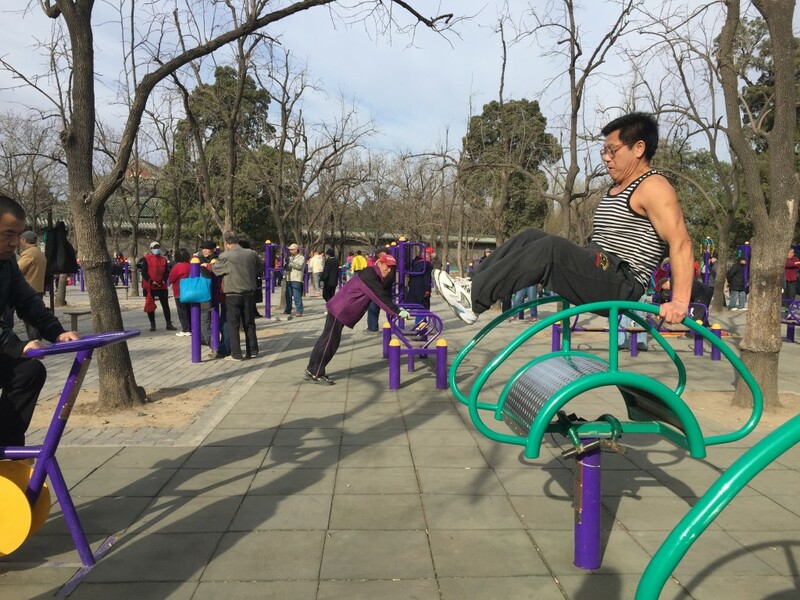 The park surrounding the temple is unlike any place we had ever been before; it is filled with senior citizens doing every kind of exercise (in large groups) imaginable—weight lifting, Kung-Fu, Thai-Chi, Tibetan dancing, Chinese body slapping, aerobics, jumping, etc. Due to Larry’s incessant encouragement, Daniel and I joined in on a few exercises—mainly Tibetan circle dancing—of course Larry joined in also (see video). 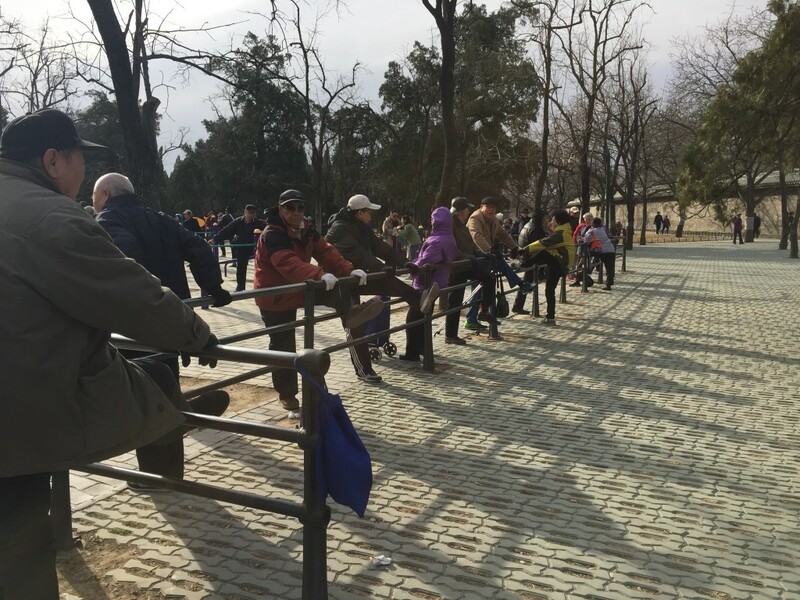 The park surrounding the temple is unlike any place we had ever been before; it is filled with senior citizens doing every kind of exercise (in large groups) imaginable. Thai-Chiin the park outside of the Temple of Heaven. Daniel trying out some exercises with the senior citizens. 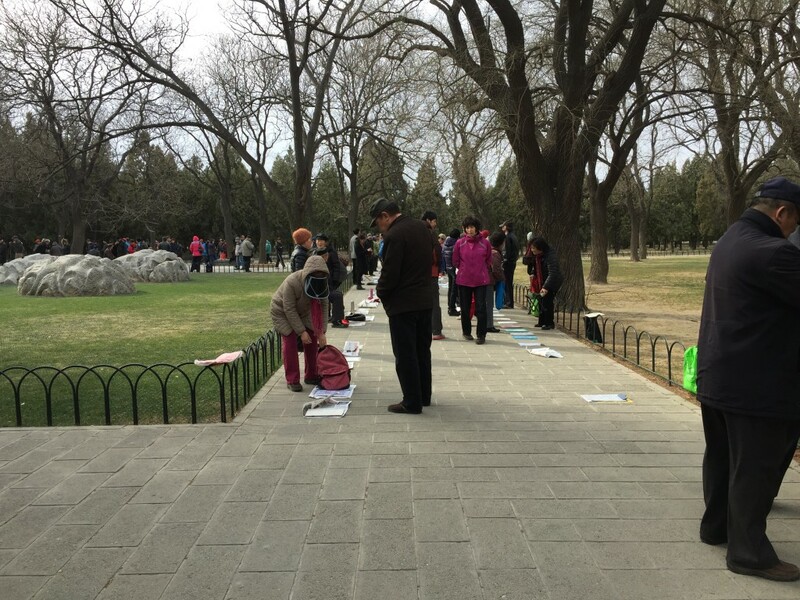 The southern part of the park where Chinese parents go to match make for their children. Match making central—good thing we already found each other or who knows what could have happened here. 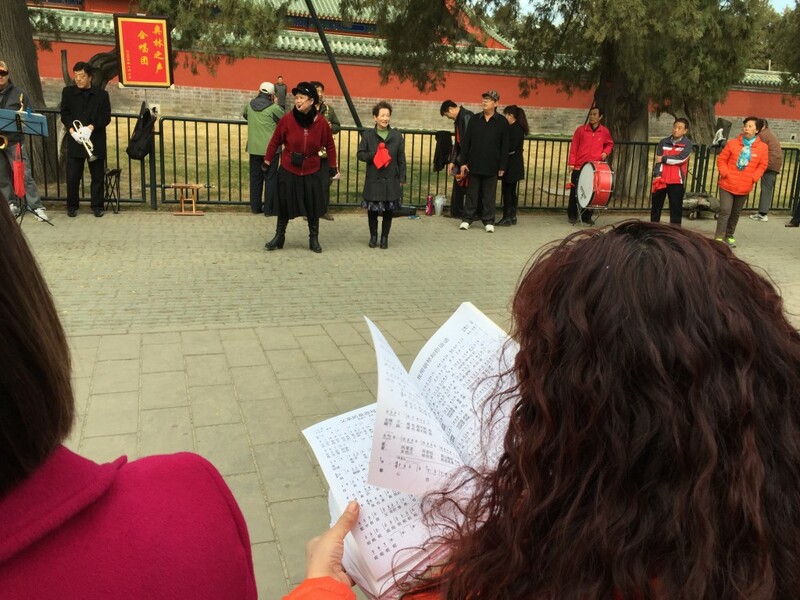 As we walked through the park we saw hundreds more senior citizens gathered around a large structure playing various games (dominos, Chinese checkers/chess, cards, dice, some we don’t have names for) and instruments on wooden beams. We also found an area where a woman with a Madonna microphone was signing surrounded by a crowd who brought their own music books in order to participate. 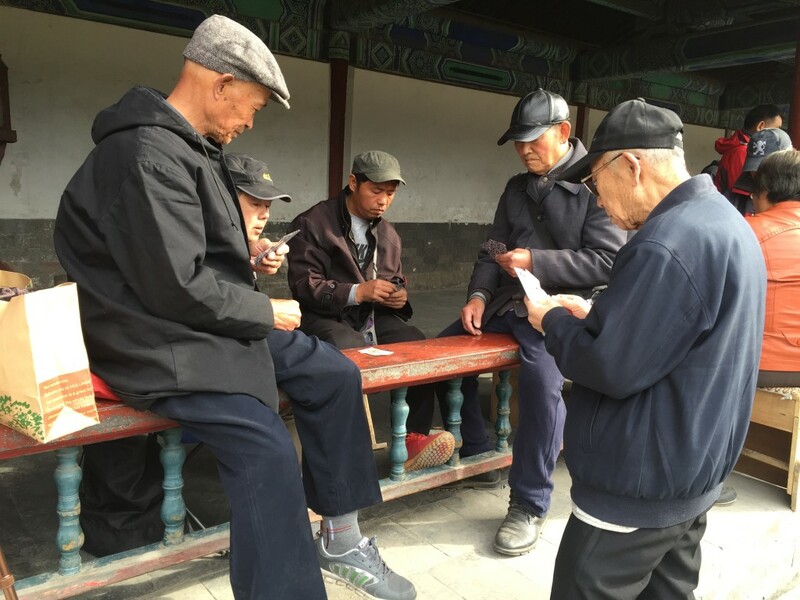 It’s amazing how the Chinese people make such an effort to keep their minds and bodies sound even in old age. 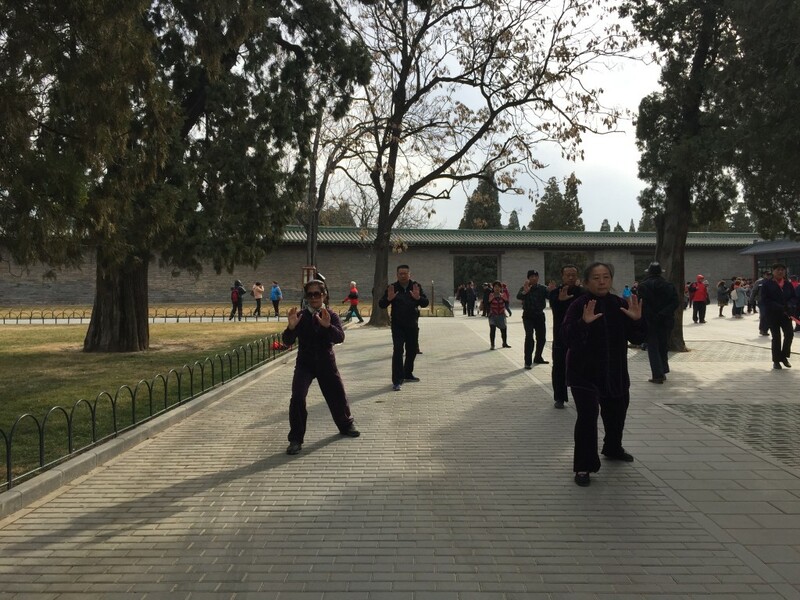 As we walked through the park we saw hundreds more senior citizens gathered around a large structure playing various games (dominos, Chinese checkers/chess, cards, dice, some we don’t have names for) and instruments on wooden beams. BYOSM—Bring Your Own Sheet Music. 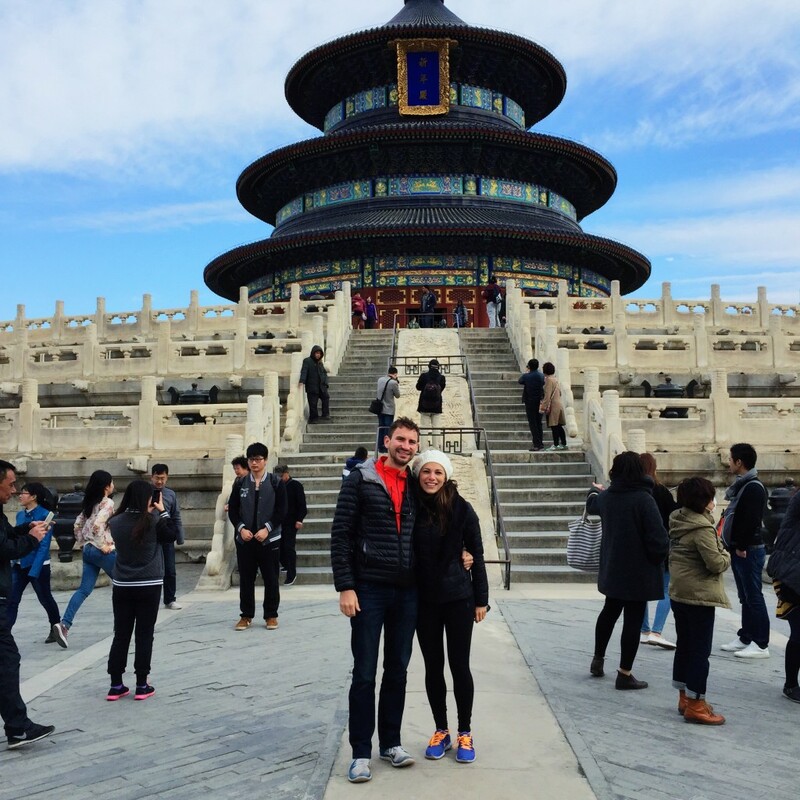 After spending a fascinating and freezing morning in the park we eventually saw the Temple of Heaven, which has three levels (the highest one to represent heaven, the middle one to represent humans, and the lowest one to represent the earth). The architecture was magnificent, but eventually it got so cold we decided it was time to end our outdoor morning excursion. 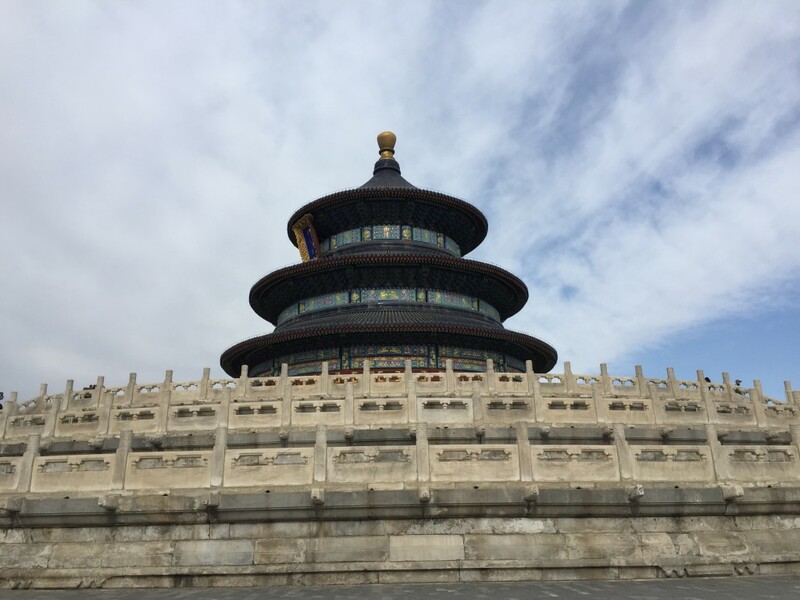 The Temple of Heaven has three levels (the highest one to represent heaven, the middle one to represent humans, and the lowest one to represent the earth). 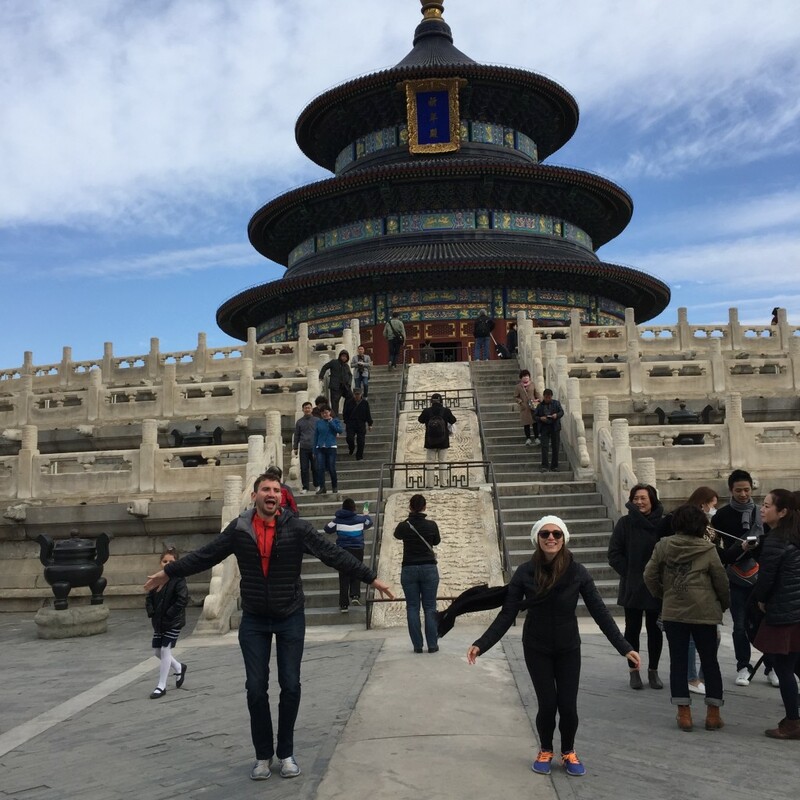 A failed Jumping Jaxy shot by Larry in front of the Temple of Heaven. 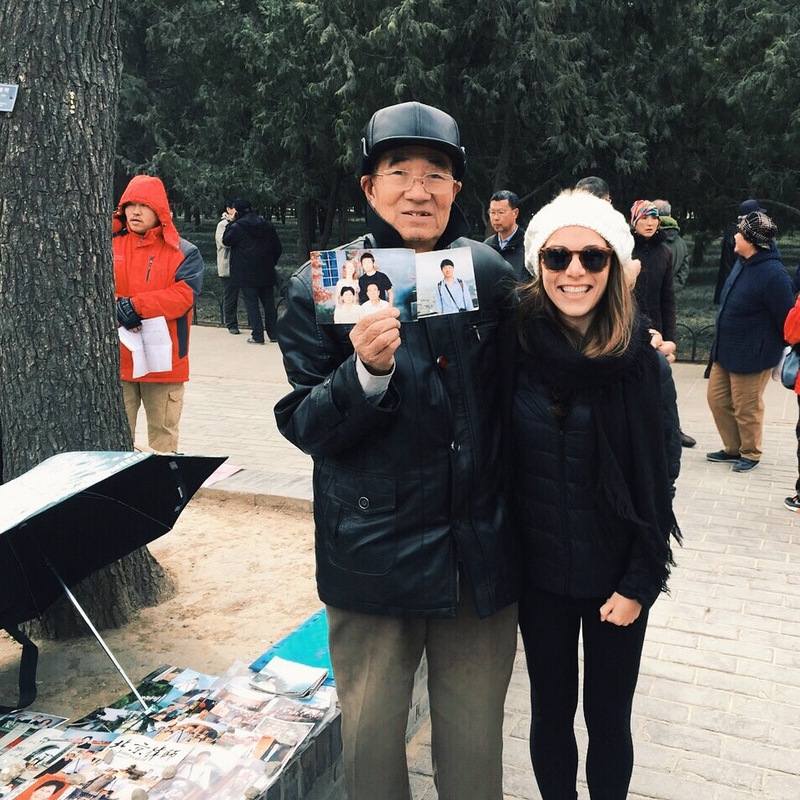 OK but for real—Larry wanted a serious photo in front of the Temple of Heaven. 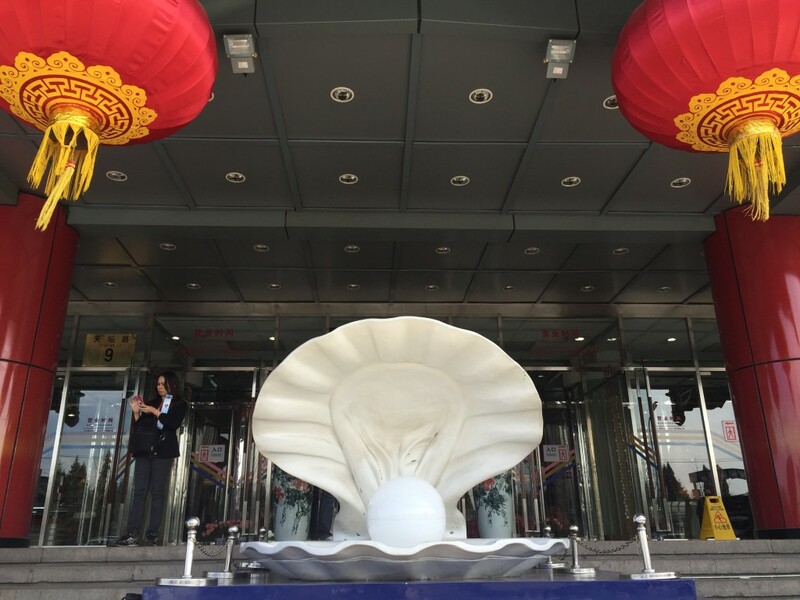 Next we went to Hongqiao Market aka The Pearl Market for a little bargain shopping. Unlike the Ladies Market in Hong Kong, the people in the Pearl Market are all over you from the second you walk onto the floor. Daniel’s first purchase of the day was a cell-phone (not actually for him) which cost him nothing. Then we went to another area of the market to a place called Steven’s Shop where Daniel scored with more gadgets and electronics. While he was doing the electronics thing, I went into a costume shop with Larry. I tried on some furry white snow monkey costume and later realized (long after I took it off) that I looked like a yeti because it had shed all over me. Larry found tape and helped me stick all the fur off in the middle of the electronics store—quite the spectacle. For lunch Daniel and I went to Subway, while Larry and the driver found a Chinese restaurant. I tried my first hot milk-tea (very good) and then ran back into the market to buy a ring and got over excited and bought a ridiculous silicone cell phone case. Hongqiao Market aka The Pearl Market in Beijing. 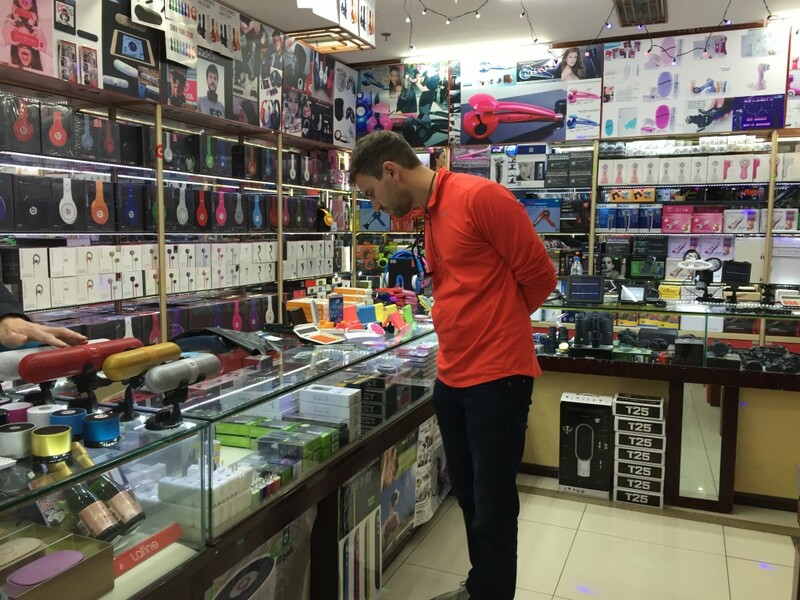 Daniel doing what he does best at Steve’s Electronic Shop in Hongqiao Market. 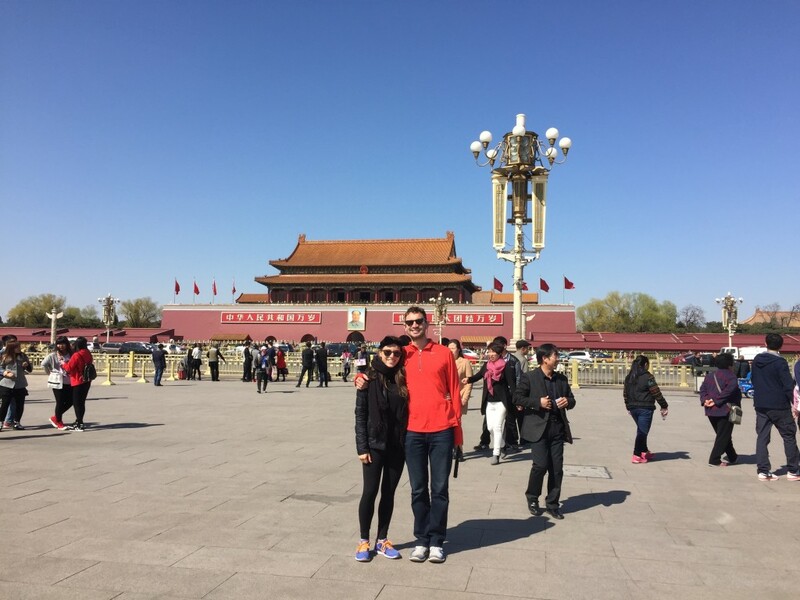 Next we headed to Tiananmen Square, which we learned is the biggest public square in the world (more than 44 hectors). We passed by the Chairman Mao mausoleum in the middle but were unable to enter because it’s closed on Sunday and Monday—Daniel suggested that it is because he is sleeping. We walked around the square and tried to replicate the same photo my parents took when they were here visiting exactly a year ago. 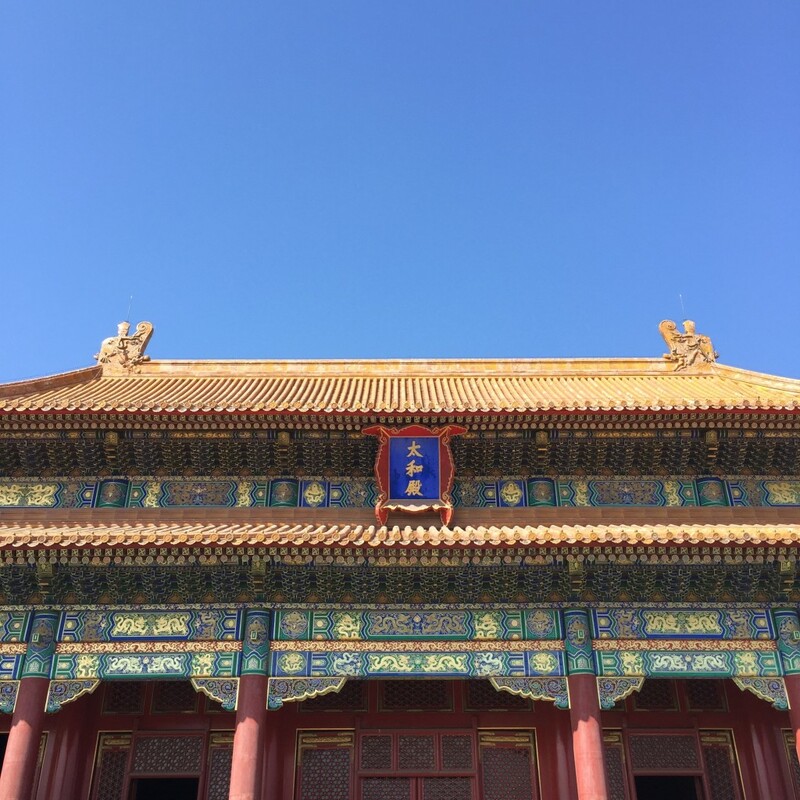 Then we crossed the street, and ventured into the Forbidden City—this place is gigantic, 170,000 people can fit inside. 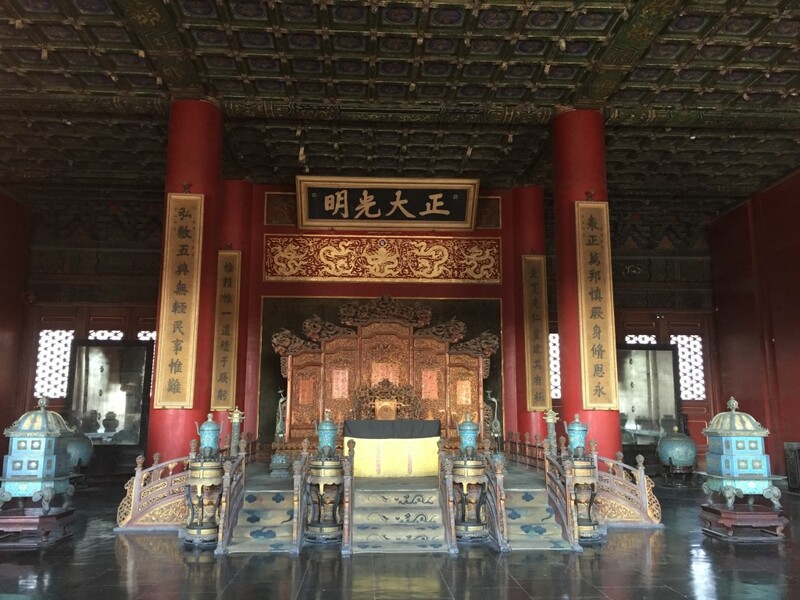 We learned about the emperor and his 300+ concubines, saw the different areas of the grounds and eventually found our way to the emperor’s quarters. I pushed through the sea of people and made my way to the front and center so I could take a photo. As I was taking the photo the man behind me put his elbows on my shoulders and used the top of my head as a tripod—I was so shocked by this I couldn’t do anything but laugh—ridiculous! 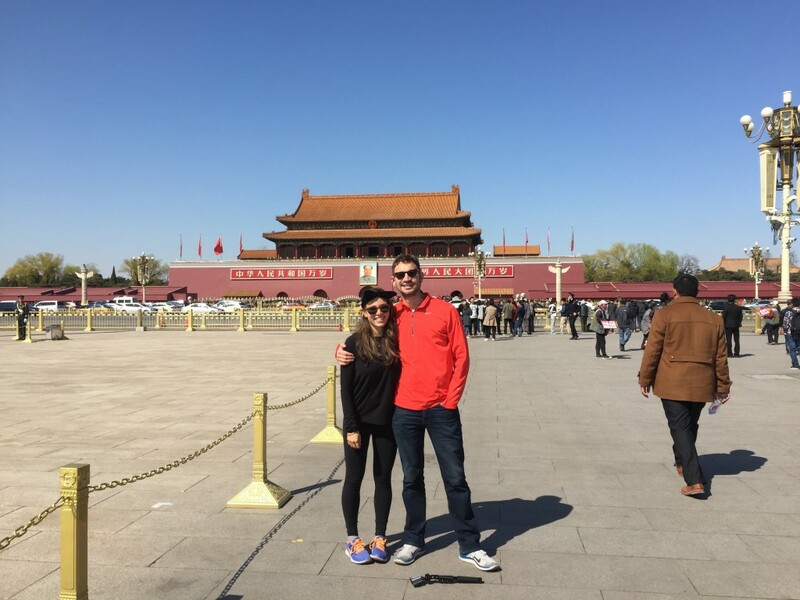 We walked around Tiananmen Square and tried to replicate the same photo my parents took when they were here visiting exactly a year ago. 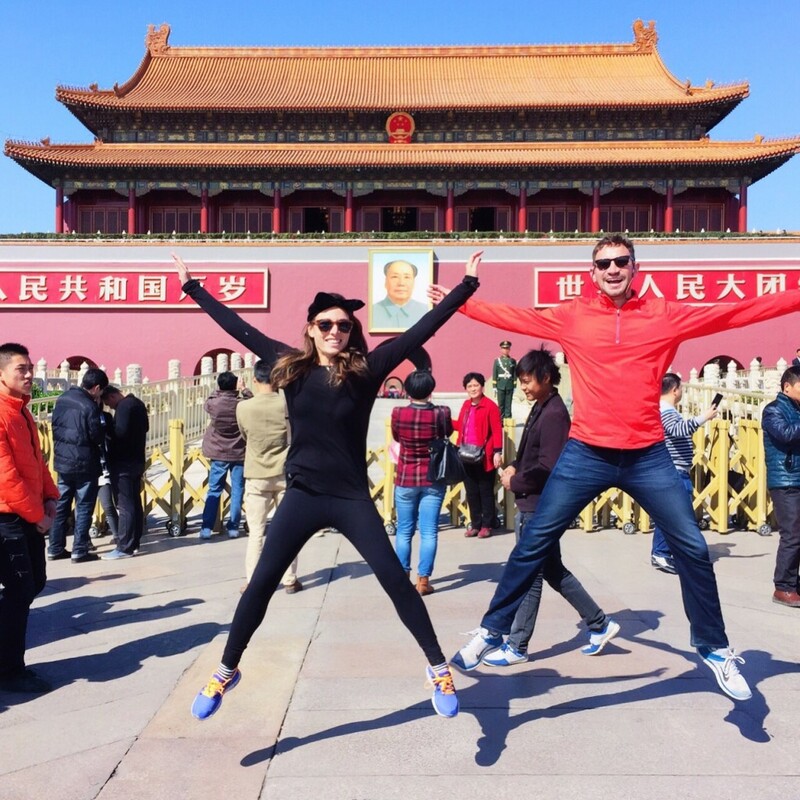 Tandem Jumping Jaxy in front of Chairman Mao in Tiananmen Square in front of the Forbidden City. 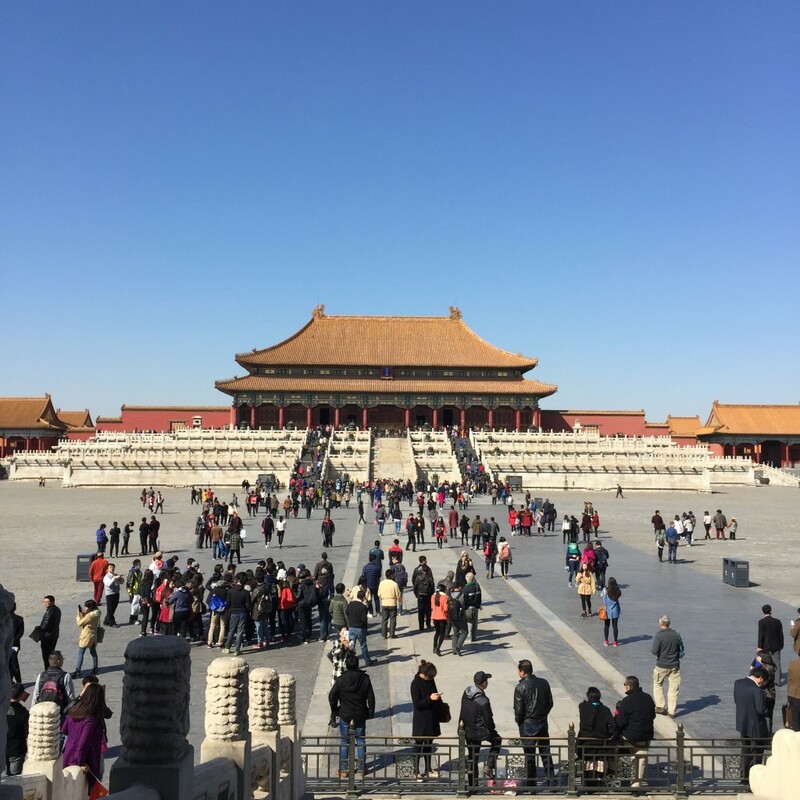 Forbidden City—this place is gigantic, 170,000 people can fit inside. The Emperors Quarters— I pushed through the sea of people and made my way to the front and center so I could take this photo. As I was taking the photo the man behind me put his elbows on my shoulders and used the top of my head as a tripod—I was so shocked by this I couldn’t do anything but laugh—ridiculous! 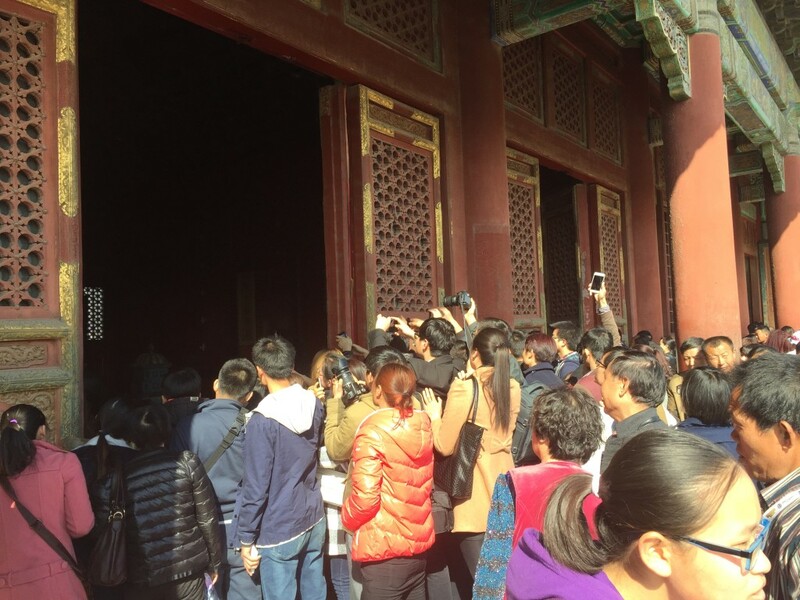 This is the crowd of people I pushed in front of to get the previous photo of the emperor’s bedroom. 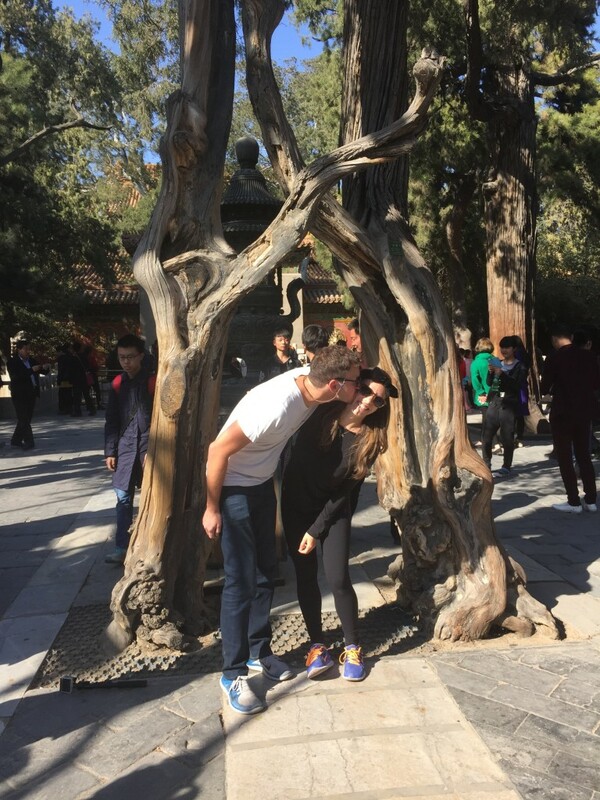 The hugging love trees in the imperial garden. Smooches. When we got back to the hotel Larry had a few questions about his website for Daniel—the next thing I knew Daniel was building Larry a brand new site and I was adding copy and photos. While website construction was going on we had some appetizers with Larry and he arranged for a driver to take us to the airport the next day as a thank you. 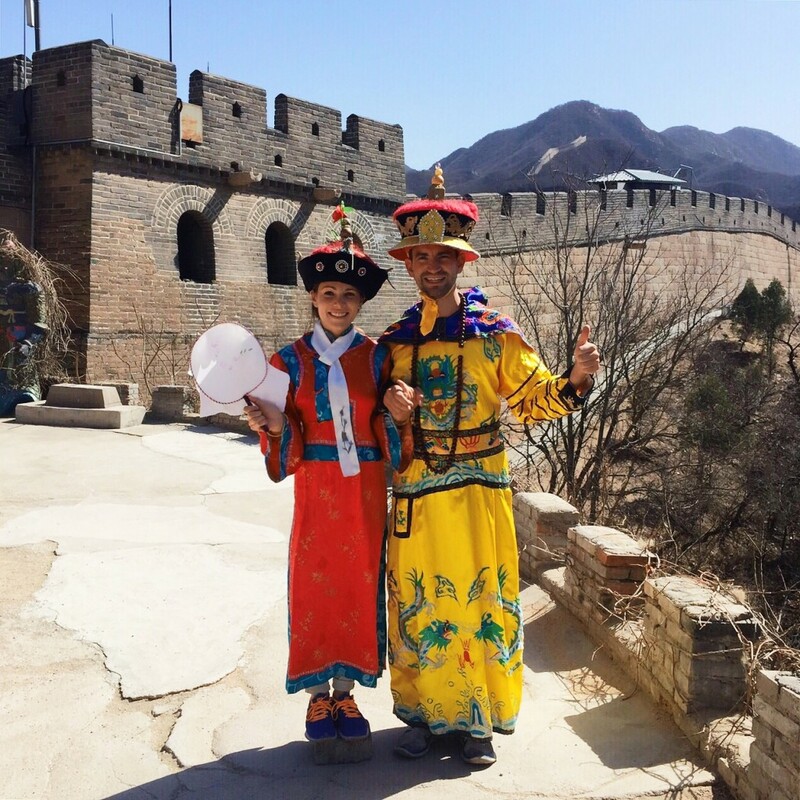 Just wait until you see the promo video on Larry’s site Kosher Beijing Tours! Monday morning we packed up and left for the airport. 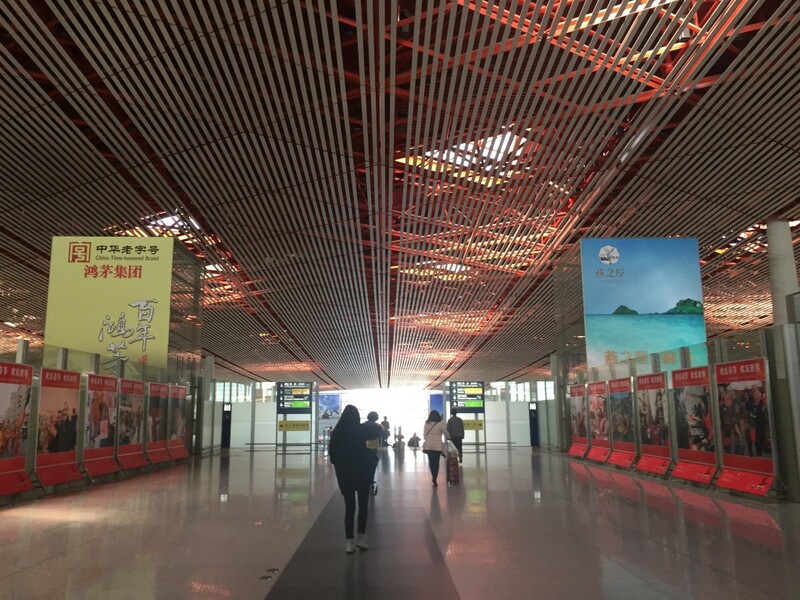 Beijing International Airport was the first place in a while where we were able to seamlessly check into our flight without a problem. 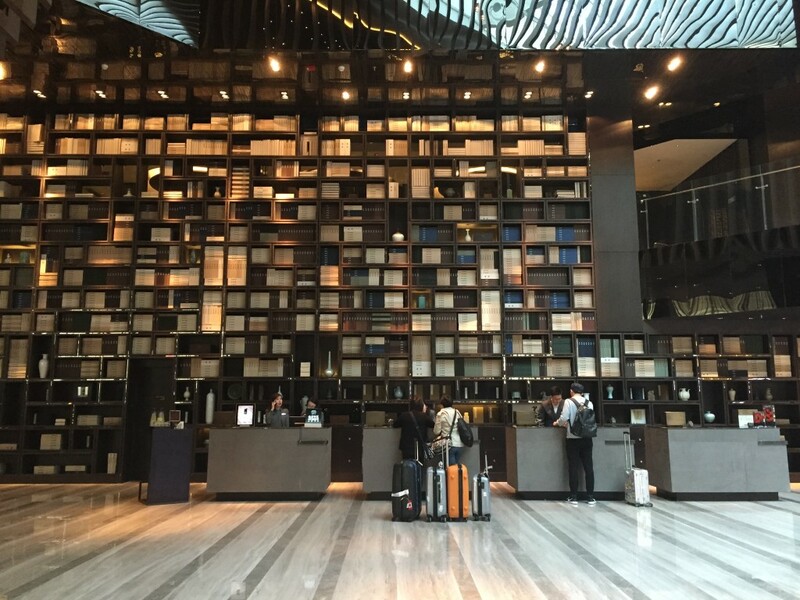 Part of the reason we were able to check in could be because All Nippon Airways (ANA) is not a Chinese airline; the other part could be attributed to the fact that Daniel called United Airlines the night before to confirm. The security at this airport is the most ridiculous and unnecessary waste of people and time I’ve ever seen in my life. They have multiple security check points, scanners and wanders. 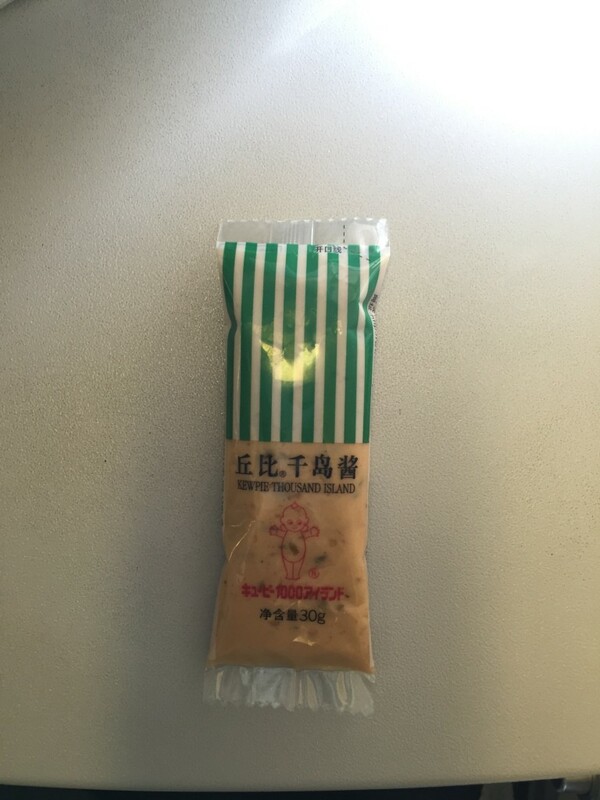 I was wanded for a good two minutes until the security chick discovered a cellophane mint wrapper in my back pocket and questioned me about my intentions with it (Wait what? Is this real life? 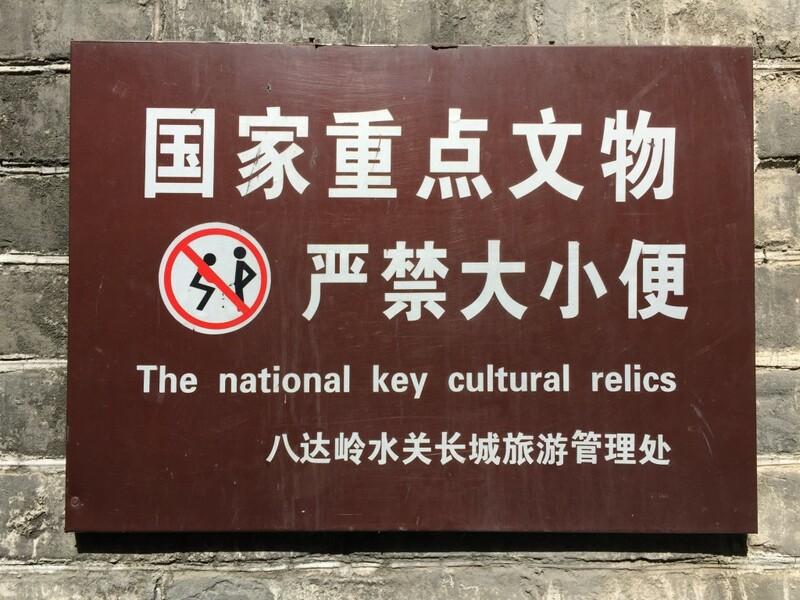 Welcome to crazy China). Then they took our portable China because they thought it was a bomb. They showed us some print out in Chinese after they took it that they claimed said it we weren’t allowed to have it. Daniel told them that in America they would consider this stealing. Security Line at the Airport. This man refused to accept that there was plenty of space around him and instead decided to become my shadow. If he could have fit in my bag, I’m sure he would have climbed in. This is apparently normal here. 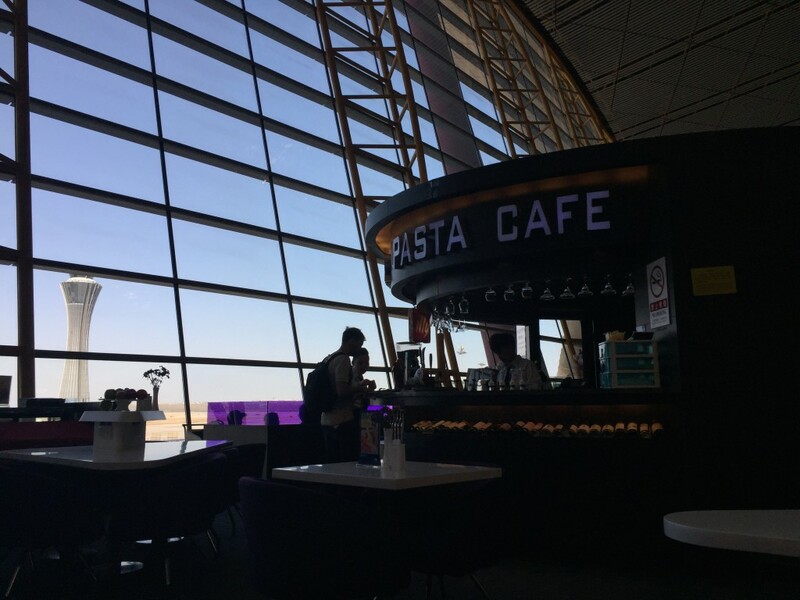 We tried to find a quick restaurant to eat at before boarding the plane, but were weirded-out to learn that the only restaurants in the terminal were gourmet other than Pizza Hut (but for them to make a pizza takes 40 minutes). We found a poor excuse for an Irish Gastro Pub and begged them to make us French fries in ten minutes. Then we rushed to our gate to board the plane. The only restaurants in the terminal were gourmet other than Pizza Hut (but for them to make a pizza takes 40 minutes). We found a poor excuse for an Irish Gastro Pub and begged them to make us French fries in ten minutes. 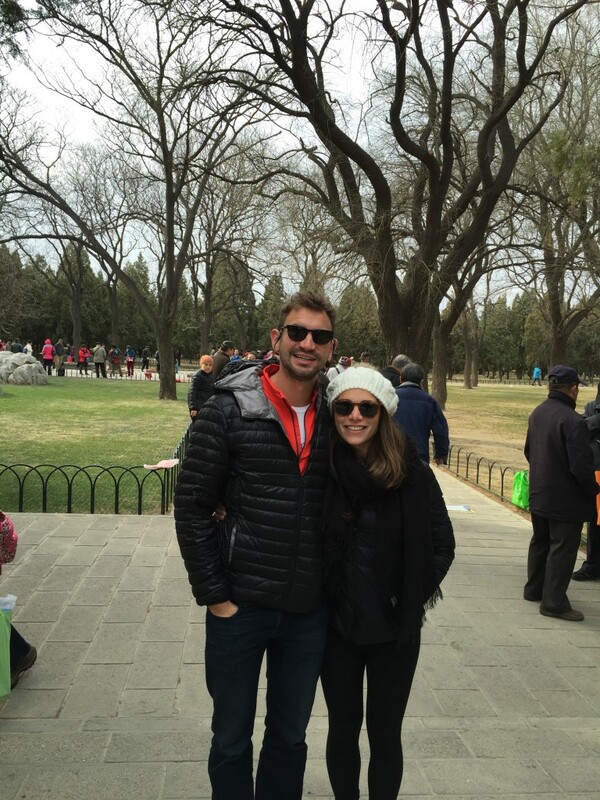 Aside from the airport, we had a fabulous time in China. 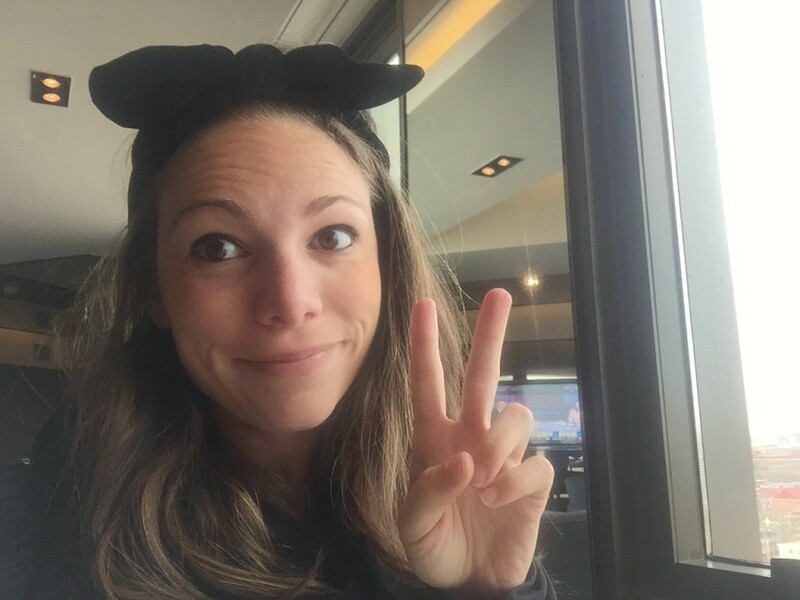 Now off to Japan!